My husband, John, knows I am a huge fan of pumpkin. Yes, I am one of those people, the ones who love pumpkin in just about any form: beer, bread, dessert, pasta, bagel, coffee…. But when it comes to comfort food as the temperature drops, hearty vegetables like potatoes, yams and all types of squash are also something I like to have often. Yesterday was one of the first chilly days of the season, and it also happened to be a big football day for me as I waited for the Sunday night game (I am a Patriots fan). John’s team plays tonight, so as I watched the pre-game shows and the afternoon games, he made us a late lunch: roasted vegetable bisque with pumpkin muffins. This soup was absolutely delicious. And I have to give him props: He created the recipe himself. John roasted the vegetables in the oven. If the wind wasn’t blowing so much, I think slow-roasting them on the grill would have been really good. And smoking over fruit or pecan wood chips would add an interesting level of flavor to the veggies as well. Maybe next time…. 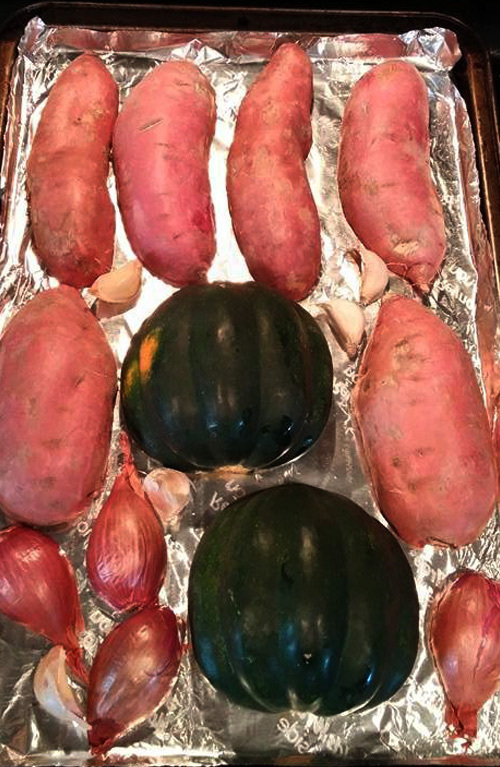 Cut potatoes, shallots and squash in half. Brush olive oil on the cut sides and put face down on a cookie sheet, along with garlic cloves. Roast for approximately 45 minutes in pre-heated oven. Pour vegetable stock into a large soup pot. 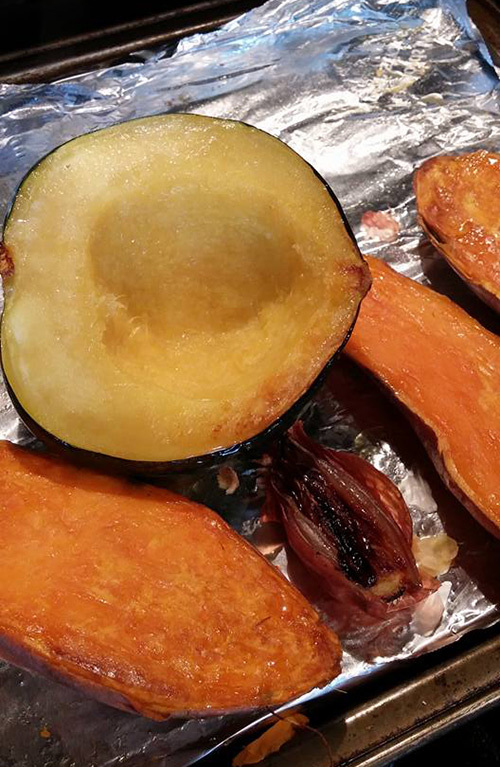 Once the vegetables are taken out of the oven, allow them to cool a bit (to be able to handle). Spoon out the insides of the potatoes and squash and add to the stock. Remove skins from garlic and shallots and add to stock. Cook the soup for about 10 minutes, over medium heat. Once pureed bring the soup back to a low boil. Place butter in a small skillet over medium heat and melt until foamy. Add the flour and herbs, using a whisk to incorporate everything together. You do not want this to turn dark. Keep stirring for about 2 minutes to fully mix everything together. (At times the roux will be clumpy or foamy but eventually with the low heat and stirring it becomes the consistency of wet sand). Add roux to soup and stir. Add Asiago cheese and stir (provides a sharp, semi-sweet taste). Salt and pepper to taste, and cook for about 30 minutes on low heat. Serve with a dollap of sour cream and basil leaves. Other garnish ideas: crumbled bacon, roasted pumpkin seeds, roasted or candied walnuts. 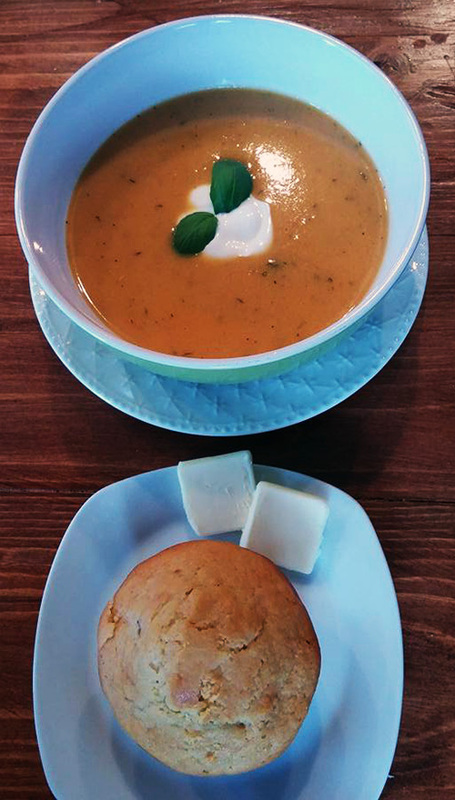 The sweetness of the pumpkin muffin was really good with this bisque, although a hearty whole grain bread with honey butter would also be delicious. Along with a few hearty ales, this was the perfect game day meal. Next Captain Lawrence Brewing Co.